Leaders of much of the world agreed that Qaddafi must go on Wednesday morning at a conference in Europe. Canadian jets pounded an ammunition dump on Wednesday morning near the beleaguered city of Misrata. US naval vessels launched Tomahawks at munitions storage points in Tripoli. And US ships fired on and chased away ships of the Libyan navy, which had been harassing merchant vessels carrying goods to the harbor of Misrata. Qaddafi’s forces continued to try to take all of Misrata on Tuesday, pounding the city center with tank and artillery fire. The rebels made a stand at the harbor district and insisted that they continued to control it. 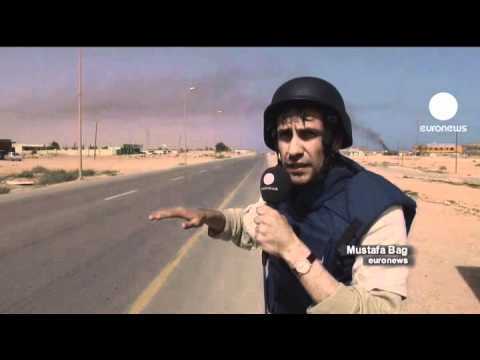 Qaddafi’s forces also pushed back the rag tag military forces from Ben Jawad. back to Ra’s Lanuf. Qaddafi’s response to the UN Security Council Resolution 1973 calling for the protection of Libyan civilians has been to launch a wideranging war against his opponents, with an eye toward consolidating his territory in the west (Zintan, Misrata, Ra’s Lanuf) in ways that the no-fly zone cannot impede. Likely these advances will provoke further aerial intervention in coming days, leveling the playing field for the rebels.